Yemeni fighters loyal to the government carry explosives and land mines believed to have been planted by Houthis on June 8 near Hudaydah. She told NPR that many local U.N. staff had chosen to stay to try to keep delivering services. "The U.N. is doing everything it can to continue its programs," she said in Amman, Jordan, en route to Sanaa. "We have national teams that are in place that are going to be running those programs. There are so many lives at stake." Grande says U.N. studies estimate a shutdown of the port over "many months" would put a quarter-million Yemenis at risk of dying from malnutrition or cholera and other diseases. Yemen is heavily dependent on imported food, fuel and medicine, and the U.N. estimates that 70 percent of Yemen's imports come through Hodeidah. Pro-government forces backed by a Saudi-led coalition have been fighting Iranian-aligned Shiite Houthi rebels for the past three years in what was already one of the poorest countries in the world. The U.S. has supported the Saudis with refueling, targeting intelligence and continued arms sales — moves opposed by some member of Congress as the bloodshed has continued. 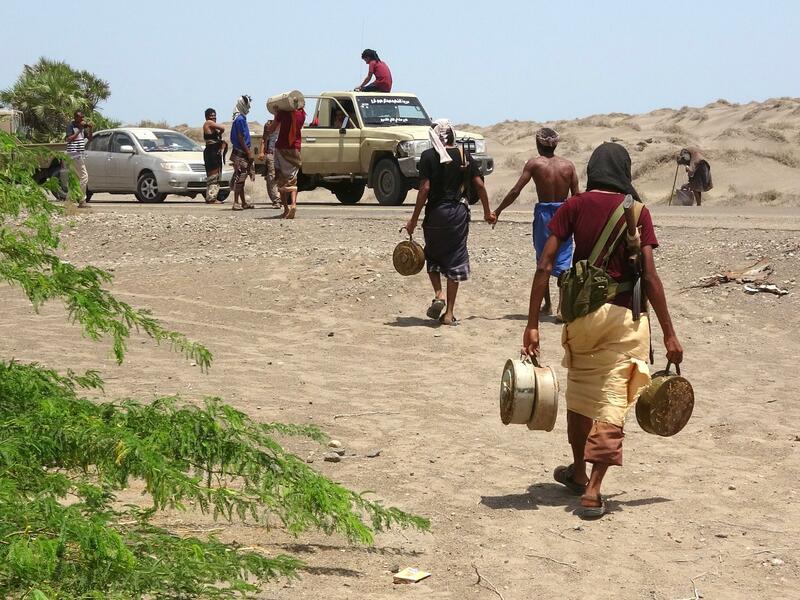 In the past week, fighting has intensified and Emirati forces in the Saudi-led coalition supporting Yemen's exiled government have advanced on Hodeidah. "The Emiratis believe if they strangle Hodeidah, they can force the Houthis to come to the bargaining table," said a Western diplomat, who asked to not to be identified to be able to speak more freely. "We are at the present moment in intense consultation," U.N. Secretary General Antonio Guterres told reporters Monday after a closed session of the Security Council. "I hope that it will be possible to avoid a battle for Hodeidah." The U.N. envoy for Yemen, Martin Griffiths, has been shuttling between the Houthis, the UAE and Saudi Arabia during a lull in fighting to try to find a political solution that would prevent an attack. A proposed peace plan calls on the Houthis to give up ballistic missiles in return for an end to the Saudi-led coalition bombing campaign and an agreement for a transitional government. The Houthis have used the missiles to target Saudi Arabia. Other aid groups have also pulled staff out of Hodeidah and other parts of the country due to deteriorating security. The International Committee of the Red Cross (ICRC) last week said it had pulled 71 international staff out of Yemen and moved them to Djibouti. A Lebanese ICRC employee was shot dead in April, when a gunman opened fire on his car in Taiz, in southwest Yemen. Doctors Without Borders said Monday the Saudi-led coalition attacked a new cholera treatment center in the northern province of Hajjah. It said no one was injured in the attack, but has suspended work in the area until it can guarantee the safety of staff and patients. The International Crisis Group, a U.S.-based think tank, warned in a report Monday that intensified fighting would make it harder to reach a negotiated settlement and would plunge the country into even deeper devastation. More than 10,000 people have been killed and 3 million displaced since Houthi forces seized Sanaa three years ago. The U.N. considers Yemen the worst humanitarian disaster in the world, with 22 million people in need of aid. "This continues a clear trend in Yemen's war: the warring factions are overconfident in their military prospects, almost always press for military advantage when there is an opportunity for negotiation, and are all too often starkly indifferent to the humanitarian impact of their actions and the plight of ordinary citizens," the Crisis Group report says. Secretary of State Mike Pompeo said Monday that he had spoken with Emirati leaders and "made clear our desire to address their security concerns while preserving the free flow of humanitarian aid and life-saving commercial imports." Diplomats speaking on condition of anonymity so they could speak candidly describe Pompeo's statement as a "yellow light" to the Emiratis to proceed with caution. The UAE and the U.S. are close military allies. While Pompeo's statement fell short of a public warning to stop the threatened assault, the UAE's hesitation to proceed without U.S. approval may have provided a window of opportunity for negotiations to continue, one Western diplomat said.